This drawing is a copy of a painting attributed to Leonardo da Vinci in the Louvre, Paris, thought to represent a mistress of Francis I.
Ingres’s work precisely traces the subtle contours of the painting revealing his skills as a draughtsman, but Ingres omits the parapet at the bottom of the original painting. 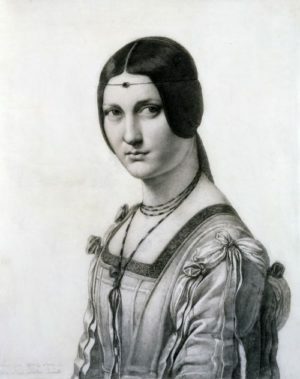 Ingres made countless copies after the old masters. This drawing was made when the artist was a student and presented to his master David before he left for Rome in 1806.